I knew I had put off the grilled pizza write-up long enough already when I was at a rooftop party in downtown Providence Sunday evening, and a writer friend of mine started gently needling me about it. Thanks for the kick in the pants, Jan.
I’m going to do this in installments, if that’s okay. I’ll be including recipes and photos, and if I put it all in one single post, it would just be too damn long, so screw that. Let’s start with the pizza dough. The crust is a crucial element of a great pizza; it’s the base, so you want it to be good. This dough is my current favorite; it’s easy to make, and I love how it tastes. I want to continue tinkering with it, though, trying to make it more better, but this is the latest. [Overnight fermentation] gives the enzymes time to go to work, pulling out subtle flavors trapped in the starch. The long rest also relaxes the gluten, allowing you to shape the dough easily, minimizing the elastic springiness that so often forces you to squeeze out all the gas. If the thought of squeezing out the gas makes you giggle like a child, you’re not alone. 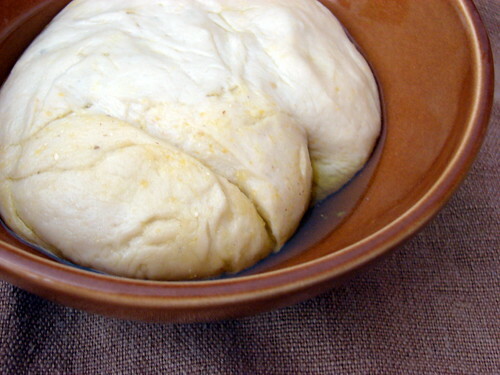 My recipe is adapted from Mario Batali’s Italian Grill, and my technique includes instructions for using a Kitchenaid stand mixer to mix and knead the dough. *As with all bread baking, you may have to adjust this, depending on humidity level. I normally use King Arthur organic unbleached AP flour, or a roughly 50-50 blend of AP and Kenyon’s stone-ground whole wheat flour. Reinhart, however, recommends you use no more than 10% whole-wheat or rye to substitute for an equal quantity of white flour. This is exactly the kind of thing I want to play with next time around. Dissolve yeast in warm water in the warmed bowl of a stand mixer. Add salt, sugar, olive oil, wine or vermouth, and half of the flour. Attach bowl and dough hook to mixer. Turn to speed 2 and mix about 1 minute. Continuing on speed 2, add remaining flour, 1/2 cup at a time, and mix until dough clings to hook and pulls away from sides of bowl. Knead on speed 2 for another 2 minutes. On the day I’m making the pizza, I remove the dough from the fridge two hours before making the pizza. I’ll address what comes next when I get to the post on building the pizza. Wow! You mean my harassing tongue can do good instead of evil! Hooray! Thanks, Mike. You’re awesome. Can’t wait to give it a try. Here’s what Batali does. Put the dry ingredients in a large bowl and mix ’em up well. Make a well in the center, like Christine’s mom does. Add water, wine, and olive oil. Stir with a wooden spoon to moisten the dry ingredients, then mix everything well with your hands in the bowl, until the dough comes together and starts to pull away from the sides. Then gently knead it on a floured surface for about 5 minutes, adding flour as necessary. When looking back at Molto Mario’s recipe, I noticed that he uses 2 teaspoons instant yeast, which I also sometimes do in place of the active-dry yeast. If you use the instant, you don’t need to bloom it in water first, so you can just mix it with the dry ingredients in the bowl. If you use active-dry, I’d bloom it in the warm water before pouring the liquid ingredients into the well in the bowl. My mom used to and still does make dough by hand, she cleans her kitchen table VERY well places the flour in in the middle of it, and makes a well in the center…then she works from inside to out incorporating flour as needed to make a clingy dough…any thing left over, gets left on the table (she usually scoops it up and reserves it for flouring for later on in the process.) From there she kneads the dough for about five minutes to form a smooth dough, but here it looks like two mins. should be enough, or at least provide for slightly less gluten formation. In any case, I might do this mixing the half portion of flour w/ the liquid in a bowl, turn it onto a clean counter and add in 1/2 increments until the dough is still a little tacky and then continue on with kneading…but please know I am by no means an expert and totally defer to Jen. OH, sorry should read before hitting enter, she puts her wet ingredients into the well and then works from the inside outwards. I have been waiting for the dough for the grilled pizza for a loooooooooong time! Looking forward to the continuation of your pizza adventure. I use my grill as an oven, putting quarry tiles inside and baking the pizza on top. Works great, but it is not really grilled pizza. I am overjoyed! Thank you so much for posting this! I know what I’ll be doing this weekend. THANKS (to both Dietsch & Christine!) I think I can handle that. Am excited to try.